Wondering what Live Tasks are and how can they help you? Here's a detailed description of the feature itself and its benefits for you. Tasks help you organize and arrange your work with your prospects within Reply. You can manually create tasks of several types and automatically receive suggested tasks based on the activity of your campaigns. The Tasks page consists of three sections with tasks and two blocks of filters. By default, you can see the tasks planned for today (TODAY section) and PAST DUE tasks. 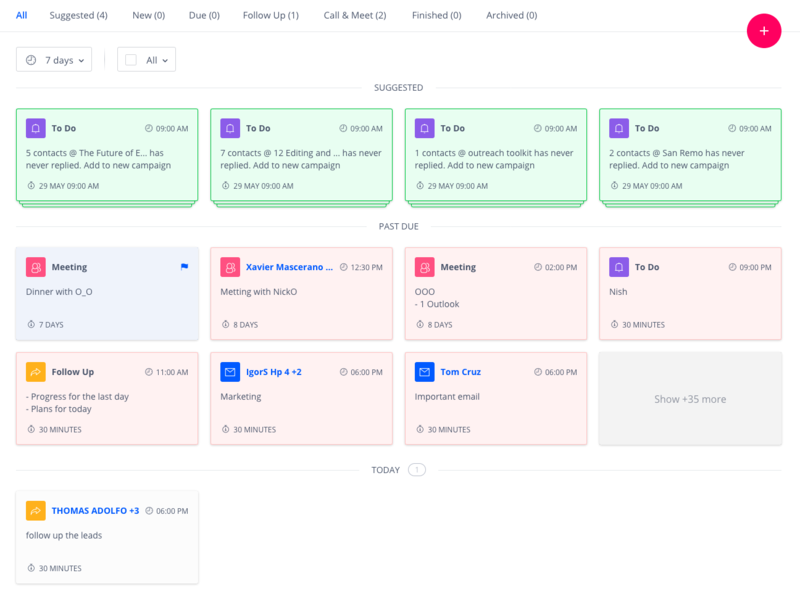 The SUGGESTED section displays tasks depending on the activity of your campaigns. By default, each section displays the first 7 tasks in the tile view sorted by the start date-time. To see more tasks, you must expand the section by clicking Show more (if there are no tasks, the system hides this section). If the task is overdue from yesterday or earlier, the system displays it in the PAST DUE section. For more information on how to create a task, see the following article. There are several task types when you create a new task. Use this type as a memo for any planned activity. Use to set up a reminder to send a personal email to your prospect during a given period of time. Use if you want to make a direct call to the prospect. Use a reminder about the text communication with the prospect. Use to schedule a meeting with the prospect. Any follow-up activity with the prospect. New: The task gets this status after you create it. White color. Finished: The task gets this status when you click the Finish button. Blue color. Overdue: The task gets this status when its due time passes, but you do not perform any action with the task (snooze or finish). Red color. Archived: The task gets this status after you archive it. Gray color. Suggested: The task is created by the system automatically. Green color. You can sort tasks by date and task type. By default, you can see the tasks for the next seven days. Using the Custom filter, you can select the date range within one month before, or after, the current date. The All filter includes all tasks except archived. Archived tasks do not appear in any filter except the Archived filter. The New filter displays regular tasks created during the last 24 hours. The Due filter displays the overdue tasks. The Follow Up filter filters the Follow Up tasks. The Suggested filter filters the Suggested tasks. 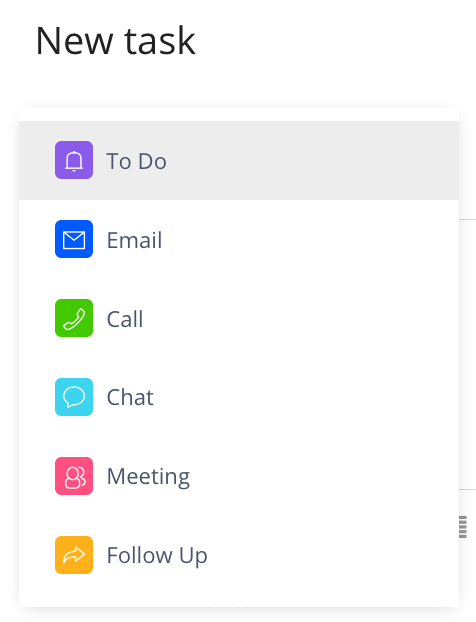 The Call & Meet filter displays tasks of two types - Call and Meeting.